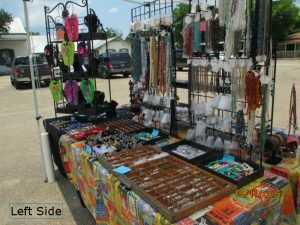 Saturday, June 11, 2016 I went to Castroville to participate in their Castroville Market Days event. I took a nice mix of custom made jewelry and jewelry making materials. 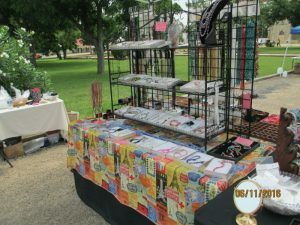 I sold a variety of items that day…..leather bracelets, Spurs bracelets, and many of my $20 custom necklaces. The initial rings were also well received. Charms and rosary making findings were the most popular jewelry making items that I sold. Had a great time and met some REALLY nice and friendly people. 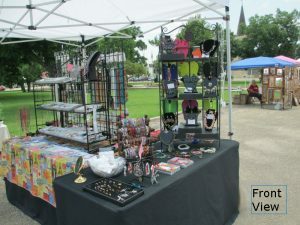 Check out the pictures of my booth. Hi my name is Molly Meyer. 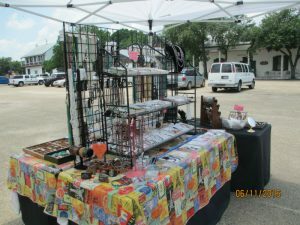 Last Sunday I bought several items from you a Trader Village that includes 2 strings of glass beads that were half black and half clear, memory wire, long curved spacers that we had difficulty finding and a bag of spurs charms. The spur charms were 12 for $5.00. If I bought 60 charms, could you give me a better price? I know you don’t remember me, but my granddaughter was with me and yu showed me how to make the spurs bracelet with memory wire. Hopefully, you received my e-mail. Currently, I am not sure if I have 60 charms. I will check Friday when I go to TV to pay my monthly rent and get back to you. I can give you a small price break but not too much since my profit margin was rather low on this item. I sent you the information about the wholesaler that I use for this item. That might be your best bet to order directly from them since you want a larger quantity. I do remember you since I had such a hard time finding those darn tube spacers.